Jump back with me into “Mad Men” time. Don is still married to Betty, and the Draper family is finishing up a family picnic at a park. Before heading back to the car, Don throws his beer can across the lawn, and Betty shakes the trash – and there’s a lot of it – off the picnic blanket. Then the two walk off, heads held high, leaving the garbage strewn across the grass. Of all the shocking and outrageous things Don Draper has done over the years, this littering gets under my skin the most. While we all know that litterbugs pollute the world, it’s really quite shocking to think that shaking trash out onto a park lawn could have been considered acceptable behavior mere decades ago. And yet, it was for many. Thankfully, we’ve come a long way, and our laws now reflect more fully the concern we have for our environment. Disposing of our waste is a regulated behavior, and people face fines and criminal repercussions for breaking those laws. Here’s what you should know. Littering. It’s illegal. Virginia prohibits dumping or disposing of trash, garbage, refuse, or litter on public property, including highways, or on private property without written consent of the owner. Violation of this law is a misdemeanor punishable by up to twelve months in jail, a fine of up to $2,500, and/or mandatory participation in not less than ten hours of community service in litter abatement activities. We’re not talking about a simple fix-it ticket here, folks. Lighted materials. It is a class two misdemeanor to throw any lighted material, including cigarettes or matches, from a vehicle. Again, no small matter. Household hazardous waste (HHW). The Virginia Department of Environmental Quality defines HHW as any substance that contains corrosive, toxic, ignitable, or reactive ingredients. 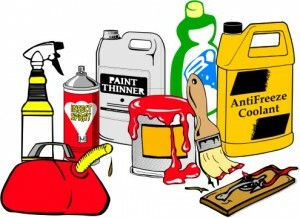 Some common examples include old paints and paint-related products, pesticides, compact fluorescent light bulbs, thermostats containing mercury, pesticides, pool chemicals, drain cleaners, used motor oil, oil filters, and antifreeze, computers, Tvs, cell phones, and unused or unwanted pharmaceuticals. HHWs should not be poured down the drain, on the ground, into storm sewers, and in certain cases, may not be put out with your regular trash. Contact the VA Department of Environmental Quality or the Central Virginia Waste Management Authority for guidance on lawful disposal in your area. Nuisance. When a person unreasonably and substantially interferes with another’s use and enjoyment of his or her own property, the interfering party can be held liable in a civil case. It’s a kind of polluting of your environment, really. Common examples of a nuisance include foul smells (a neighbor who decides to install a small pig-farming operation) or unreasonably loud noises (a band rehearsal ten feet from your bedroom window at three in the morning). And when someone’s actions affect five or more residents, those affected people can join together to petition the court for a grand jury investigation into the potentially unlawful behavior. Of course, try being neighborly first and talking to the offending party. The hassles and time spent in court would be best avoided, but the remedy does exist for extreme situations. As a mom who wants the world to stay green for her child (and hopefully even for her grandchildren), I often find myself wanting to go on the offensive – to throw people’s trash back through their car windows. Perhaps you feel the same. A more effective strategy, would be to try and model conscientious efforts and teach them to others. This may take some effort, but together, we can do it.